Ideal for fresh or salt pools. Water features. Pools create a lot of joy for families and friends. But they can cost a lot to maintain. 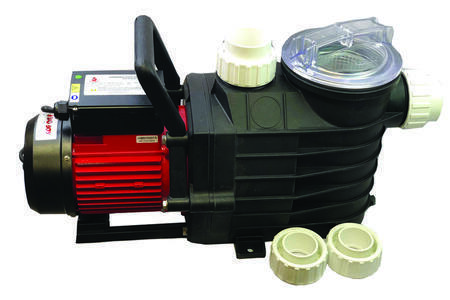 Using a 2 speed pump cuts down on power consumption by up to 25% (335KW) per annum. That could mean within 3 years the pump has almost totally paid for itself. Energy savings are based on 50,000ltr pool with a head of 3mtr running a 1.5Hp dual speed pump. The other great benefit is LOW NOISE!Running at low speed the pump drops to below 38dB about the same as being in a library. A single speed pump runs at over 50dB which is like being back in the office. So, it’s good for your head space and the next door neighbours as well. Maintain your dual speed pump in the same way you would a single speed version. Before installing ensure the low speed pump metrics suit the L/max & Q/max properties of your particular pool. Installations, where the pump site is above pool level “must” have a non-return fitting in the in-line. Please Contact Space Industries to check for stock availability. Click here to download Alpha Pump information leaflet.